The Economist does not waste its readers’ time. Nevertheless, and despite being published only weekly, it can be difficult for even a motivated reader to keep up. A pile of as-yet-untouched Economist issues is a common complaint, despite the best of intentions. Longstanding readers have developed their own habits and strategies for reading to avoid this; new readers have not had the chance to do so. There are a number of obstacles to overcome in making reading The Economist a habit. For one, the subjects we report on: we take a global view on politics, business, finance, science, the arts and more. Each reader will be more interested in some of these areas than others — but the traditional table of contents list found in print (and recreated digitally) may not be enough to help a reader identify and prioritise the stories of most interest. Secondly, a weekly newspaper is not always easy to fit into a modern lifestyle. Traditionally a reader might devote a few hours at the weekend to reading The Economist. Bill Gates, for example, is a long-time subscriber who claims to read it cover-to-cover every week. But this is a rarer habit for people to develop today: instead, people are more likely to devote smaller chunks of time to reading, while commuting or during a lunch break. Finally, our readers are spending more of their time reading on smartphones rather than in print or on tablets. Articles written for a traditional print publication may not be suitable for reading on to a handheld device. Our mission is the same as ever: how can we help our globally curious and time-poor readers understand what’s going on the world as quickly and effectively as possible? But the way we accomplish it needs to change to take these developments into account. How can we further distil our weekly analyses to better suit our readers’ new reading habits? 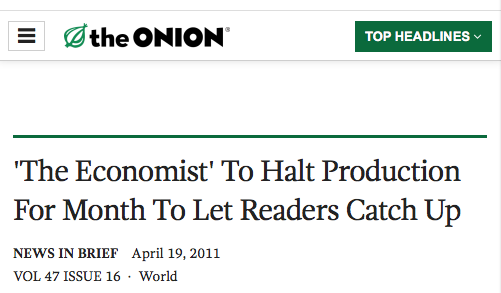 As a product manager at The Economist, I am currently working on solutions to these problems. Add your email address below if you would like to help us test some of our ideas; you will be notified when we have more to share. Deputy Head of Product at The Economist. I am product manager for the new Economist iOS app.